In SpectraLayers Pro, you can work with the individual sounds in an audio file just as if they were objects in a photograph. Precisely remove frequency ranges from the mix and move or delete them. Locate interference in the new 3D displace mode, precisely remove or or move around sounds, reduce noise and clutter and increase clarity. Transform a sound picture into something new and different with the free trial version of SpectraLayers Pro. spectral editing platforms for free. 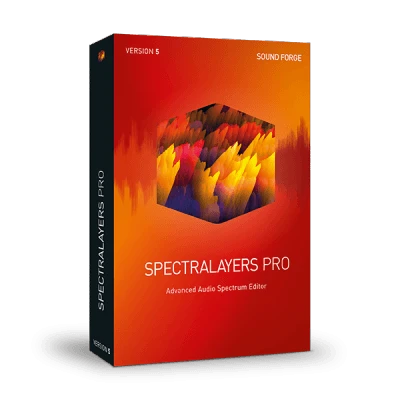 Access complete freedom for audio editing and sound design with the free 30-day trial version of SpectraLayers Pro. The latest version combines a high-performance core audio engine with an outstanding program design to form one of the world's most revolutioanry platforms for spectral editing. Try out Spectral Casting and Spectral Molding, also included in the free version of SpectraLayers Pro. With Spectral Casting, you use the frequency spectrum of one layer as a cast for the overall mix. Start now and open up unexplored new worlds of audio processing possibilities. Spectral molding uses the frequency overlaps between recordings to create entirely new sounds. For example, imagine a guitar recording with an acoustic texture of vocals! Perform noiseprint-based noise reduction using customized noiseprints containing multiple frequency bands of any width. The Spectral Graph assigns each layer a customizable color. Modify the sequence for different layers easily by mouse. The Layers, Channels, and History panels can now be anchored in the SpectraLayers Pro workspace or set to float over the workspace or on a secondary monitor. Added by popular demand: double click to reset the fader to 0 dB. Scrub audio in both directions using the cursor. Performance improvements and optimized CPU support in the redesigned SpectraLayers Pro engine. Now available in SpectraLayers Pro. Discover one of the world’s most revolutionary spectral editing platforms for free.